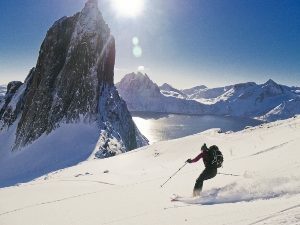 We’ve written the following advice to help you through the trip selection process – firstly by deciding whether our trips are suitable for you, then by filtering the selection based on your ski ability, ski touring experience and finally, by the special characteristics of different tours and touring regions. You are at Ski Tech Level 1 (or below), on our off-piste ability levels. Our Advice: In order to join our ski touring courses you need be at the minimum off-piste standard of Tech Level 2 – therefore, we recommend that you take some off piste coaching lessons, or a join an off piste skiing course with a qualified ski instructor, in order to improve your off piste ski standard before you take up ski touring. Please get in touch and we will put you in contact with a good BASI qualified instructor. Our Advice: You are at the minimum level to join our range of Ski Touring Skills Courses, which make a perfect introduction to the sport! If you are nudging Tech Level 3 and haven’t ski toured before, then look at our Skills Courses. If you have ski toured before (a minimum of 2 days touring on Alpine Touring Kit in an Alpine region, with at least 2-3 hours of uphill skinning each day) then you can also look at our Introductory Hut Trips. 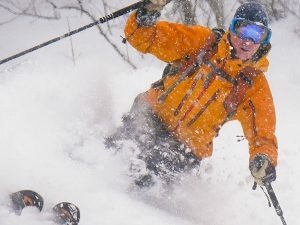 No ski touring experience? 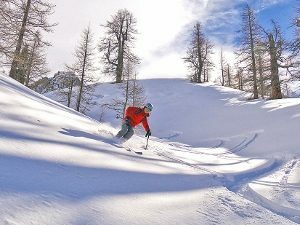 – If you haven’t ski toured before, then consider our Skills Courses (so long as you don’t mind being in a mixed ability group, the enjoyment of teaching courses isn’t usually affected by mixed ski abilities, as there are plenty of teaching and skills sessions going on, as well as the skiing). 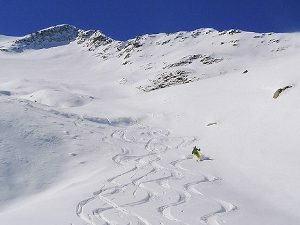 Alternatively, if you want a faster paced, more descent focused week -then look at our range of Backcountry Ski Holidays. These all feature some skinning days, as well as lift assisted skiing and are an ideal trip for established off piste skiers to learn some basic touring skills. 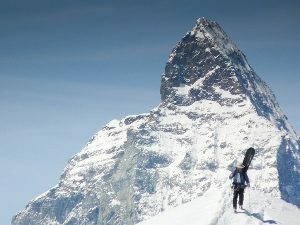 A few days ski touring experience? – If you have done a few days worth of ski touring and you are a good standard off piste skier, then our Early Season Day Tours and Norwegian Day Tours are both good options for a first dedicated ski touring holiday, or to build up experience for a multi-day tour in the future. 1 -2 weeks or more of ski touring experience? – Any of our intermediate level trips are suitable! 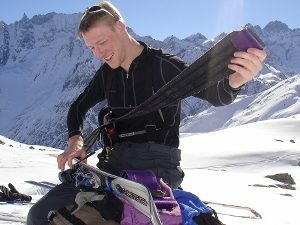 Several weeks ski touring experience? 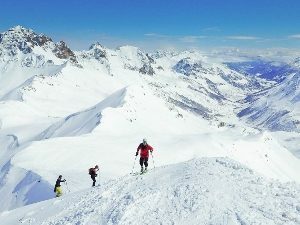 – If you are an experienced ski tourer, with several week long trips and/or hut to hut tours under your belt, then your choices extend to our Off The Beaten Track and Ski Mountaineering trips as well. Here are a few general thoughts on fitness requirements for our ski tours. Our Skills Courses, Early Season Day Tours and Norwegian Day Tours are generally more comfortable and a bit less strenuous – there are some notable exceptions though, so please check the individual trip pages for detailed info (likewise, if the group is fit and fast, then we won’t leave you short changed!) On these trips, we usually carry lighter rucksacks, ski at mid or lower altitudes and the itineraries are more easily tailored to suit group fitness as required. Most of our mainstream Italian/Swiss/French/Austrian Hut to Hut Tours demand good fitness (Fitness Level 3) as you are carrying a rucksack with overnight gear and there is generally a requirement/some time pressure to reach the next hut or stopover. 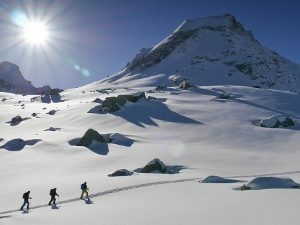 Our Ski Mountaineering and Off the Beaten Track trips demand higher levels of fitness, for strenuous peak bagging days at higher altitudes, or to ensure an increased safety margin whilst skiing in remote areas. Below we give an overview of the different type of trips that we offer and the main regions where we ski, in order to help you choose the perfect holiday! Our skills courses are designed for off-piste skiers who want to get into ski touring! All courses are valley based, staying in a local hotel (on some, we also spend one or two nights in an alpine hut). The key features are: skills training, delivered on real days out ski touring and inclusive groups, which allow for a range of abilities. Uplift is sometimes used and the pace is generally quite relaxed in order to allow time for teaching and learning. These are descent focused off-piste ski weeks, where you stay in a comfortable valley hotel. We use uplift most of the time, plus some skinning and boot tracking to access the best runs. A good ski standard is required on these weeks, in order to keep groups well balanced. You need to be happy skiing in trees and on steeper 35-40dg terrain, as these often feature. 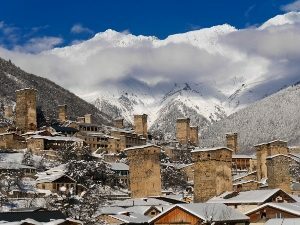 Our early season day touring weeks are mostly based in quieter regions of the Southern French and Italian Alps, in search of early season powder. These are valley based weeks, staying at a local hotel and the focus is day touring. In good weather we visit local summits and viewpoints, but the best snow is often found at mid altitudes – so you need to be happy skiing in trees in order to enjoy these weeks. Most of these trips start and finish with a pickup/drop off at Turin Airport for convenience. Each season we run a number of tours that are suitable for a first multi-day hut to hut tour. You need the appropriate ski ability, fitness and some day touring experience in order to join, but each week starts with a shakedown day to warm up and refresh everyones’ ski touring skills before setting off. Once on the tour, each day isn’t too long and can be completed at a steady pace without too much time pressure, so that you are able to build experience and refine your technique during the week. Our Norwegian trips explore the fjords and islands of Arctic Norway. These are all valley based weeks, either staying at a local hotel or self-catering accommodation, depending on the area. The weather can be very varied, with everything from clear skies and high pressure, to wild and stormy days – so you need to be prepared for this and bring good quality kit. All of our Austrian ski tours meet in Innsbruck, which offers good warm up skiing, convenient flights, and our hotel (in the historic Innsbruck old town) is just 20 mins from the airport by regular shuttle bus. From here, we organize a private group transfer to reach each tour for convenience. Hut to Hut touring in Austria is very popular, as the country boasts the most comfortable hut network in the Alps: warm hospitality, great food and hot showers are the norm. There is something for everyone – with relaxed tours suitable for beginners, through to some of the biggest touring weeks in the Alps. Access to many Italian tours is quite tricky, so to make things easier, we often meet somewhere more convenient (such as Chamonix, or a near Swiss railway) and then drive to the region. Huts are always very welcoming and facilities vary from excellent private rooms and showers in some regions, to older more traditional huts with dorms in others – please check individual trip itineraries for full info. Switzerland is home to many of the great classic hut to hut tours of the Alps, including the Haute Route and the Bernese Oberland. These two are both world famous and deservedly popular – but if you want to explore somewhere new, there are also many quieter, less well known touring regions throughout the country. Swiss public transport is excellent, so getting from airport to tour start points is always straight forward. Swiss huts are very ordered, comfortable and well-run places, but expect to pay more for drinks and extras due to the high exchange rate. A special note on the Haute Route, which is a little different from other tours. Firstly, it’s world famous and the huts are always busy if you ski it from one weekend to the next, as most groups do (mid-week departures require a little more holiday time, but are consequently quieter). Secondly, it’s a point to point tour, so bad weather has more potential to affect completion of the route and finally, despite all of this, you’ve got to ski it one day! Some of our more technical and physically demanding tours involve an element of ski mountaineering. 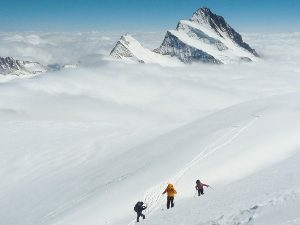 These trips require the use of ropes and climbing equipment in order to reach summits and overcome difficulties. In order to join these tours, in addition to fitness and ski ability, you also need some experience using crampons on steep ground and ultimately some mountaineering experience for the most technical trips. It’s worth noting that weeks involving ski mountaineering also require the best weather and snow conditions in order to complete safely, so we may have to change plans if the weather or conditions dictate. Each year we run a number of trips to more unusual and far-flung ski touring destinations around the globe. On these trips it’s almost as much about the adventure, exploring new places and meeting interesting people and cultures, as it is about the skiing. To join our Off the Beaten Track trips, you need a solid level of ski touring experience in order to maintain a high safety margin whilst skiing in more remote locations. Finally, you also need a sense of adventure and readiness for the unexpected – as in these parts of the world the weather can change unexpectedly, or things don’t quite go according to plan and it’s all just part of the fun! To help you filter your choices, please use the table below (select ‘Show 50 Entries’ and toggle the column headers to sort the trips).